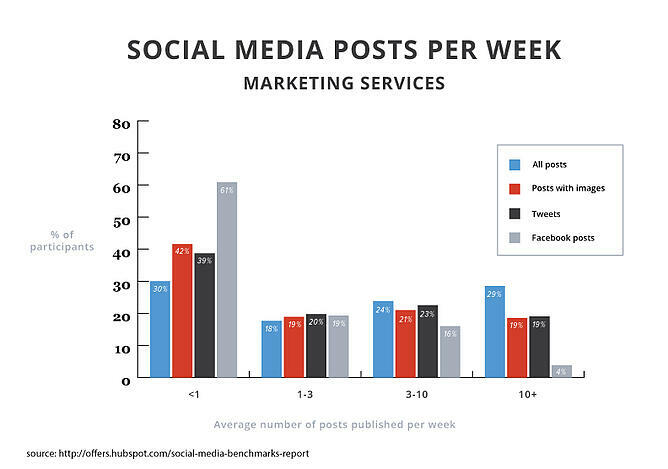 How often should you post to your social media accounts? For many marketers, this question is tough. Here’s why: Social media is a very flexible and fluid part of your marketing strategy. It’s not easy to draw the line between how much you could be posting and how much you should be posting. That’s why we created the 2015 Social Media Benchmarks Report. Marketers need actionable, tailored insight to improve their social strategy, and that’s not easy to come by. There’s millions of helpful social media statistics out there, but the most helpful ones are industry-specific. How much do they post? The real estate industry, above all other industries in our report, posts the most. Where and what are they posting? If a real estate company is going to post anything to social media, they’re likely to do it on Facebook. If they're posting more than once a week, real estate companies are more likely to publish to Twitter so they don't spam their fans. 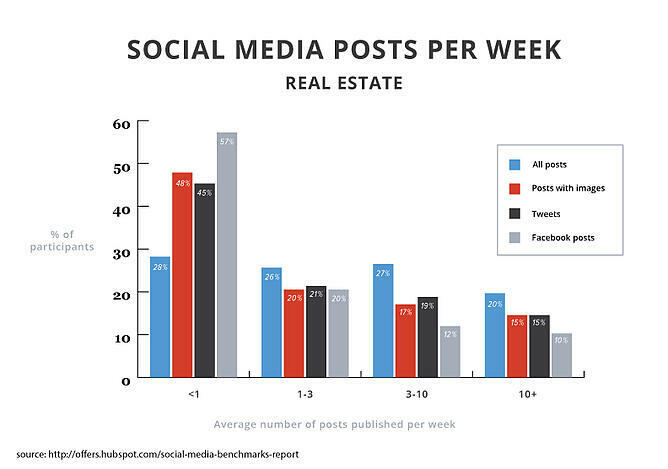 You’ll also notice that of the companies that publish less than once a week, 48% include an image in their post -- this really speaks to the strategy they employ as part of the real estate industry. You have to fall in love with the pictures of the house first before you tell your real estate agent you want to see it, so real estate marketers really focus on posting visual content (even if they aren't posting that often). If you’re in the real estate industry, consider putting your prime real estate (pun very much intended) on Facebook while giving some love to your other homes on faster moving networks like Twitter or Pinterest. While Pinterest and Instagram are image-focused, Facebook provides a nice mix of visuals and copy, so you can really write out what makes the house special while also giving enough space to use photos. If one thing stands out about this graph, it’s that the marketing services industry heads straight to Facebook. Over 60% of the companies we surveyed puts at least one Facebook post up a week. However, posts by platform start to even out with the more posts a company does. And because they inherently have a lot of content to share, this industry skews towards posting on networks where a lot of content won’t annoy your followers. Only 4% of companies are posting to Facebook more than 10x a week, whereas 19% of companies who post that much are posting to Twitter. If you’re in the marketing services industry, be aware that you have to practice what you preach about social media marketing. If you’re selling strategy that promises not to spam fans and followers, don’t spam your own. If you promise to get your clients high-quality leads through great social media marketing, you’d better have great social media marketing, too. This industry is under a bit more of a critical eye than the others because social media is likely connected to the service you’re selling. Even though 66% of companies who post only once a week post to Facebook, this industry has the second lowest average of Facebook posts published per week. This is likely due to the fact that the software and technology industry is ever evolving, both in their own products and the industry, and that requires a lot of communication with their social media fans and followers. 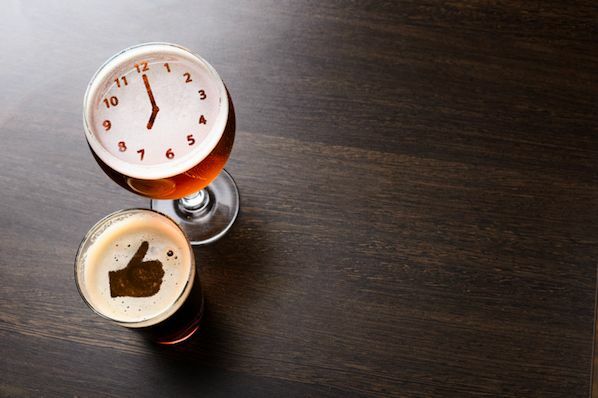 Facebook isn’t really the platform for constant, timely updates because the News Feed will only show a certain number of posts to your followers. If you’re in the software/tech industry, it may not be your first instinct to include an image in your posts. However, images still play a large part in this industry’s social strategy, even when you get to the 10x a week or more benchmark. Don’t forget that today’s social networks place a lot of emphasis on your images, so using images to show how your product works or display what a new feature looks like is key. Visual storytelling is a great way to show the benefits or value of what you offer. 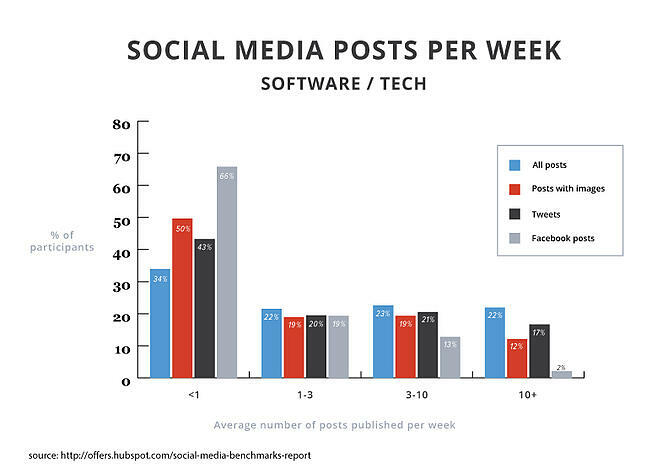 Like the software / tech industry, social media is important to the hardware industry, but has slightly lower posting frequencies when you get to the 3-10 posts per week range. However, it's worth noting that the percentage of posts with images in the 1-3 times per week range is higher than the software / tech industry's, which is interesting. It seems like hardware companies rely more heavily on images for their posts than software / tech companies do. 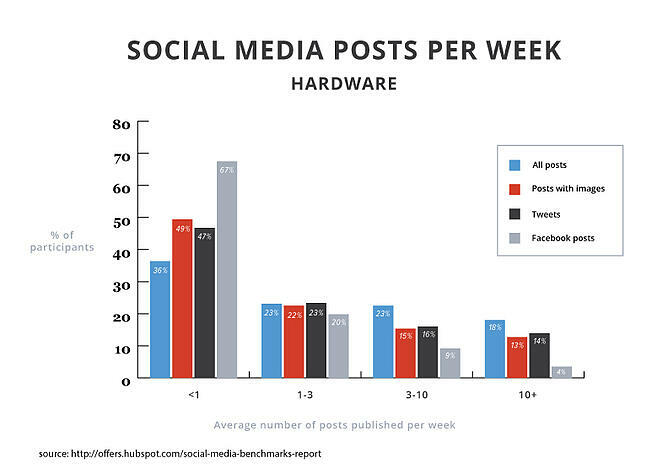 If you're a marketer in the hardware industry, consider doubling down on your social media strategy. 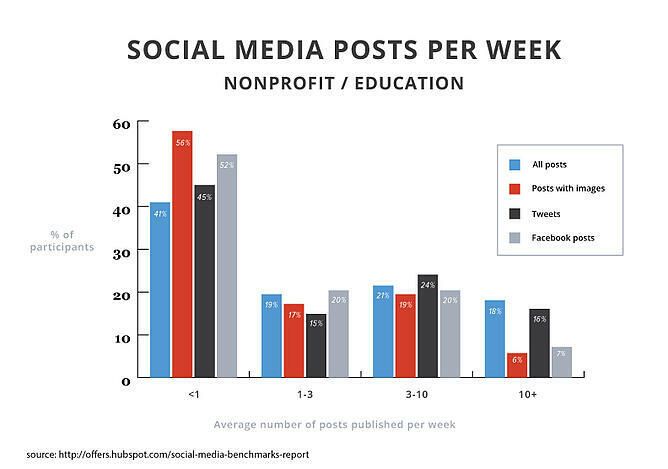 The company data from our report included in the graph above tells me that posting to social media might be a two-and-done activity for the week. If you're seeing good results from your social media marketing, don't be afraid to up the ante on how much you're posting. If you've got the content and the bandwidth, don't be afraid to use it -- just be sure you're posting to the social networks that encourage that frequency. What’s interesting about this industry is their use of Facebook. Of all the industries included in our benchmarks report, this one has the lowest percentage of companies in the <1 range for Facebook, and the second highest percentage of companies in the 10+ range for average Facebook posts. So this means that although this industry starts out posting to Facebook, they’re the only industry in our group that really keeps this trend up. If you’re in the nonprofit / education industry, don’t forget that images can be a powerful addition to your social media posts. From the graph above, you can see the percentage of posts with images start to significantly dip after you’ve posted at least 10 times a week. I’d encourage you, if you’re in this industry, to challenge this finding. If you’re taking the time to create content for social media, make sure you’re getting some graphic creation in there, too. One of the key differences of this industry lies in their use of Twitter. The business/ financial services industry has a notably higher percentage of companies that tweet once a week, and a notably lower percentage of companies that tweet in the 10+ range. This could be attributed to the fact that social media may not be the best marketing channel for this industry. Therefore, crafting a tweet that links off to longer-form content is a more effective play then trying to detail it all out on a social network. Also, the percentage of posts with images is higher than some industries, but lower than some, too. 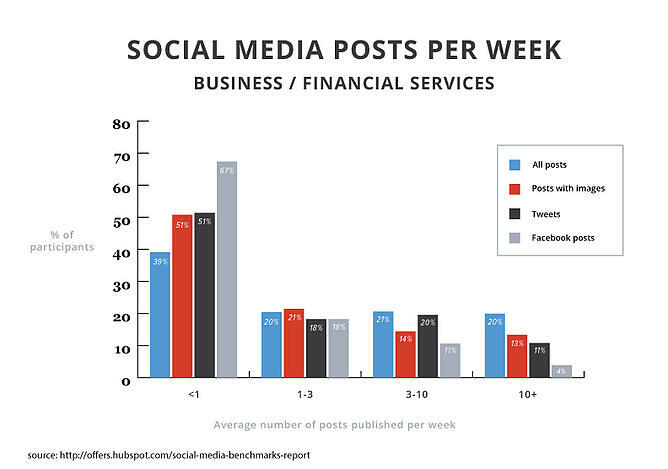 If you’re in the business / financial services industry and you’re not using social media 2-3 times a week to share content about your industry or business, consider doing so. As I mentioned above, you may already have marketing channels (like email) that’s bringing in revenue for your business. Try and figure out how you can repurpose that content to share on social networks. If you are already doing so, keep in mind that images, no matter what the topic, could catch more clicks than what you’re getting now, so the effort to create them will be well worth it, especially if those clicks lead to paying customers. This industry also tends to skew towards using Twitter instead of Facebook, although the percentage of companies posting weekly to Facebook is nothing to sneeze at. Healthcare companies are certainly using social media to share content or news, but compared to some of our other industries, it happens a lot less. If you’re in the healthcare industry, social media is likely not your top marketing channel. But that doesn’t mean that people aren’t talking about you on social media. Beyond making sure you have a presence on social networks and posting content, you can also use the search functionality on social networks to find content to share and, in turn, start to become a thought leader in your industry. Head on over to Facebook or Twitter on a day you have nothing schedule and search for keywords you know are related to your business. You never know what you’ll find. Even though this industry’s posting frequency is low, it has the fourth highest Facebook posts per week out of the nine industries featured in our report. Facebook is a great platform for this industry given its features, such as the ability to create photo albums of your goods or to easily refer people to your brand by Facebook's native sharing mechanism. So even though this industry doesn’t post a lot to social media, it seems like it gravitates towards the platform that’s right for them. 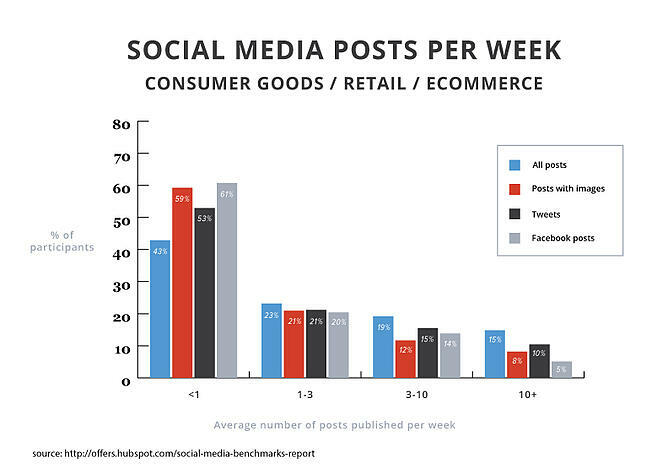 Also, the importance of images in posts seems to drop off after a company has posted once or twice per week. If you’re in the consumer goods / retail / ecommerce industry, see if you can find new and unique ways to share information about your goods. This could be challenging given the fact that the posting frequency for this industry is low, but I’ll still challenge you nonetheless. 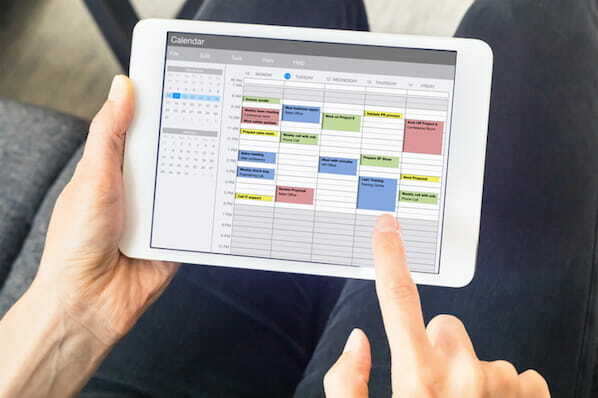 Even if you don’t have new inventory to take pictures of, or new features to share with your audience, you can still post content that answers common questions or concerns that arise around your industry. Speaking of that love-hate relationship, you can see it really play out in their use of Facebook. In our report, 74% of manufacturing companies that publish less than one post per week choose to post to Facebook -- more than any other industry we have data on. But check out what happens as you approach the 10x a week mark -- it drops all the way down to 2%. It’s safe to safe that most companies in this industry hold strong to posting to Facebook once a week, and that’s it. Twitter has a similar showing as Facebook, but the drop-off is not as drastic. 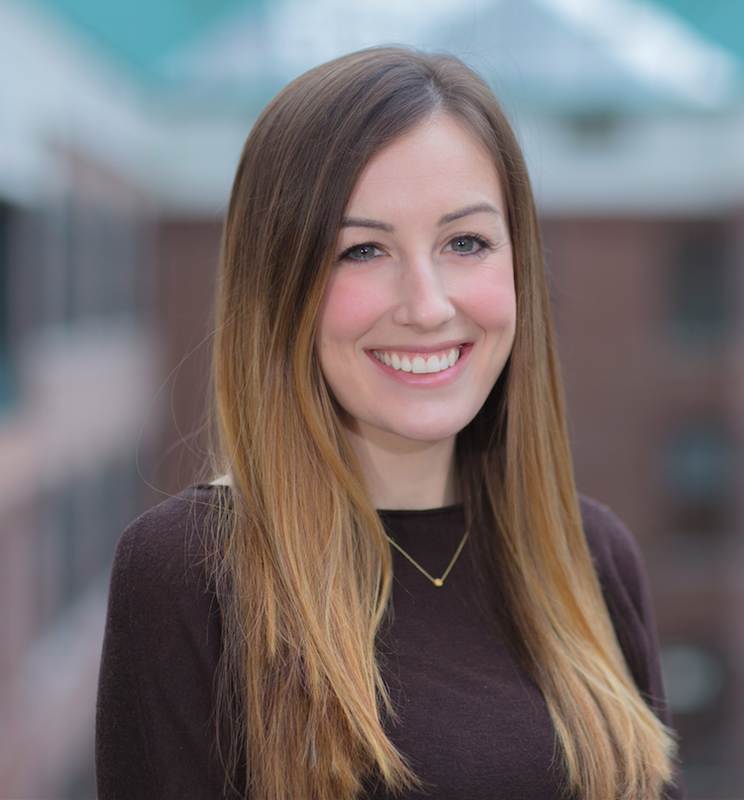 If you’re in the manufacturing industry, you are likely using social media just to “be there,” and not using it for your main source of lead generation or content sharing. I'd advise that, when do you use social media, however infrequent that may be, that you take extra-special care of what you post. 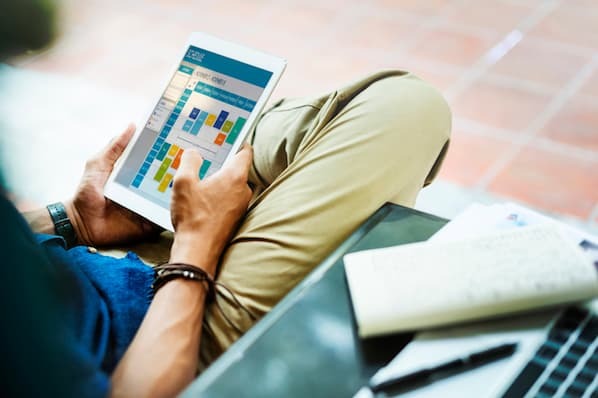 If you only update it once or twice a week, that content has to still be relevant to your audience's interests and aligned with your marketing goals. If it’s not, it cancels out the fact that you even have a presence on social media, since your content could potentially be out of date or irrelevant to your audience. Want even more analysis on industries or companies like yours? Download our social media benchmarks report for more data you can use to optimize your social media strategy.